If you’re considering our 16-month ABSN program in Cincinnati, Ohio, we thought you could use a heads up on what to expect from the first semester of nursing school. You’ll especially want to see what current students and recent graduates of the program have to say about our accelerated path to nursing. As a student in our ABSN program, your first semester of nursing school will comprise online nursing coursework, hands-on nursing labs, and practicum experiences that are broken up into two eight-week terms. Overall, semester one sets the foundation for your nursing education, providing the knowledge and skills necessary for a smooth transition into forthcoming terms. A lot of people think that learning online is easier or of lesser quality than learning in the classroom — neither of which is true. It’s a course delivery option that involves a significant amount of independent study, requiring you to have good self-discipline and time management skills to be successful. While instructor deadlines still apply, online learning allows you to learn at your own pace and attend “class” at any time of the day or night. Delivered through Canvas, a popular learning management system, each of our online nursing courses feature a series of modules. Within each module, you’re required to complete a list of activities, which could be anything from watching a video to completing a simulated case study. There’s also a live video conference feature within Canvas that allows instructors to schedule times to discuss complex concepts with students. I [completed] my ABSN prerequisites online, which really helped me. By the time I started the program, I was familiar with Canvas and how the online platform works. If you’re unfamiliar with online learning, it’s a good idea to complete your ABSN prerequisite courses online through Xavier and get acquainted with the course delivery system. While some ABSN programs require as many as 15 prerequisites, we only have four: anatomy and physiology I and II, microbiology, and statistics. Our state-of-the-art nursing skills lab, which features hospital equipment, medical supplies, clinical task trainers, and full-body manikins, provides a safe, contextual learning environment for developing basic nursing skills such as head-to-toe assessments, nasogastric tube insertion, and wound care — the types of skills that every nurse must have no matter the area of practice. “[Skills labs] start out very basic and then progressively get more advanced,” Sarah noted. “In our first skills lab, we learned proper hand washing and sterilization techniques.” Among the more challenging nursing skills that you’ll learn during the first semester of nursing school is tracheotomy care. As an accelerated nursing student, you can expect to participate in nursing labs up to three days a week. With the help of a computerized medical manikin, our nursing simulation lab takes your nursing competency to the next level. Getting you as close as possible to real-life clinical situations, these labs help develop your clinical judgment and problem-solving skills, essentially preparing you to think on your feet and act on instinct while working in the profession. Our simulation manikin lets you actively engage in patient assessment and treatment without the fear of putting an individual’s safety at risk. Under faculty control, the manikin can ask questions and replicate bodily responses to procedures, such as intubation and catheterization. Another benefit of our simulation exercises is that they allow you to be placed in patient care situations that you might not be exposed to during clinicals. Unlike a lot of nursing programs, we start you on your clinical practicum (a.k.a. clinical rotations) during the first semester. Like nursing labs, your clinical practicum starts out simple, but then we gradually place you in more complex scenarios within hospitals, rehabilitation centers, and nursing homes, etc. While we can’t guarantee where your clinical practicum will take place, many of our students gain real-world experience in top health care facilities, such as Mercy Health, TriHealth, and Cincinnati Children’s Hospital Medical Center. Lauren explains that during your first set of clinical rotations, you’re taking vitals and performing head-to-toe assessments. From there, you progress into skills such as starting an IV line, and by the fourth and final semester, you’re caring for patients as a whole. Xavier nurses are unique because they are taught to be empowered at the bedside to provide the best possible patient care. Whether you’re in your first or last semester of nursing school, our ABSN faculty and staff will be there to support you every step of the way. For example, as an accelerated nursing student, you’ll have access to an academic success coach whose job is to enhance your overall nursing school experience. 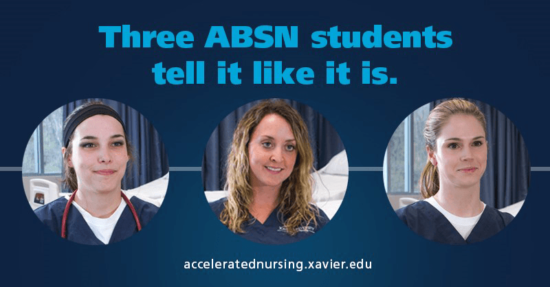 The nursing education you’ll receive as a Xavier ABSN student is second to none. In fact, local health care facilities seek out our students. “Before I even graduated from the ABSN program, I was offered a job with Mercy,” said Lauren. 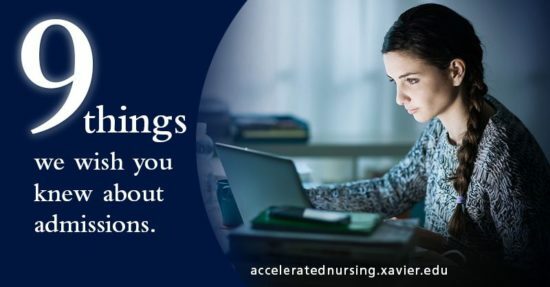 Ready to get started on your first semester of nursing school at Xavier University? Contact our admission team today!